Lectra has enhanced the user experience by making its PLM solution highly configurable. A star feature is Lectra Easy Configure, a tool that allows users to manage and organize data according to their own profile, company organization and data structure to ensure easy and round-the-clock access. This enables companies to become more agile, as users can access and analyze their data whenever they need to, quickly and without technical hiccups. 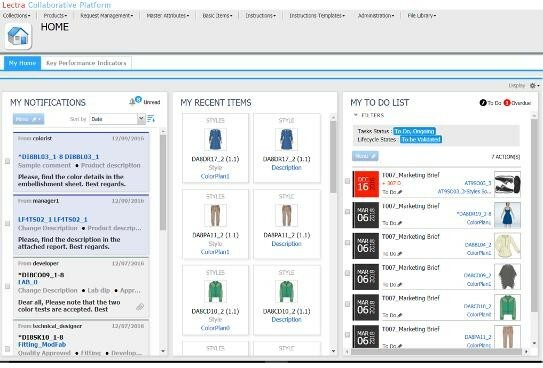 Lectra Fashion PLM 4.0 streamlines day-to-day activities via an updated interface with new search and notification functions, and a dynamic and configurable portfolio view that allows users to monitor and direct collections with the help of dynamic data display. Users can receive alerts and information about styles and materials, for example, and create to-do lists quickly and easily on a daily basis. Finally, product developers benefit from enhanced Tech Pack management that allows them more control over how tech packs are edited, extracted and shared with other actors in the supply chain.